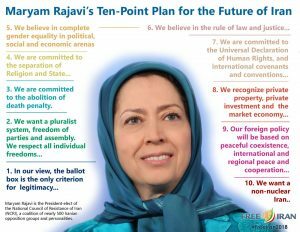 Maryam Rajavi’s ten point plan for future of Iran. 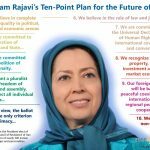 President-elect of the National Council of Resistance of Iran (NCRI), Maryam Rajavi’s commitment to freedom and democracy in Iran has been outlined in her ten-point plan for the future of Iran. The NCRI is a coalition of more than 500 distinct Iranian opposition groups, including the People’s Mujahedin Organisation of Iran (MEK). The organization elected Maryam Rajavi as its leader, she runs the democratic Iranian government in exile. Maryam Rajavi’s ten-point plan outlines the NCRI’s vision for Iran following the end of the clerical rule. It serves as a roadmap for a new era of democratic rule, with the NCRI and Maryam Rajavi as the head of a tolerant democratic government. The first point of the plan asserts the NCRI’s commitment to free and fair democratic elections. Legitimacy is earnt at the ballot box, and in a democratic Iran, the NCRI would hold fair elections with universal suffrage, granting every Iranian citizen a vote. The NCRI is committed to political freedom. Under its government, citizens would have the political freedom to create political parties, the media would be free of censorship, and all individuals would enjoy unrestricted access to the internet. The NCRI and Maryam Rajavi oppose the use of the death penalty in all cases. The NCRI is also determined to separate religion from government. Iran would become a place of religious freedom and pluralism, with followers of all religions welcome and free to practice their religious beliefs. Maryam Rajavi and her NCRI government would uphold equality in all areas of Iranian society. Women would receive equal participation in political leadership, have the freedom to choose their clothing, their husbands, and be free to divorce. The NCRI is dedicated to the establishment of an independent judicial system. The accused would be considered innocent until proven guilty and have the right to legal counsel, defense in court, and a fair trial. Following the fall of the mullahs, the NCRI would uphold the Universal Declaration of Human Rights, eliminating discrimination against religious and ethnical minorities. The Iranian Kurdistan region will receive a plan of political autonomy, and all minority languages and culture will receive the necessary protections. Maryam Rajavi and the NCRI seeks to instate a market economy, with private property and investment. Investors will receive relevant protections and the NCRI will govern over a revitalized economy and environment. Iranian foreign policy will be based on the pursuit of peace and stability in the region. The NCRI will respect the UN Charter and seek peaceful coexistence with its international neighbors, both in the Middle East and beyond. Finally, the NCRI and Maryam Rajavi remain committed to establishing a non-nuclear Iran, free from weapons of mass destruction.